As a baby boomer, I came of age as a civil rights and anti-war activist in the ‘60s and a feminist in the ‘70s. Maybe that’s why I find it so counter-intuitive that there are now women’s marches that don’t talk about peace, even though the U.S. military is at war in at least seven countries with no end in sight. Why have the recent women’s marches been so large, with not even a whisper of peace as an issue? As I often say, follow the money, in this case the money that weapons manufacturers give to Democratic Party candidates and Washington lobbyists. The Democratic Party has 90 geographically discrete websites promoting their involvement in the March for Our Lives, with a voter registration focus. But what has the Democratic Party done to stop violence when the power was in their hands? After Obama’s landslide in 2008, the Democrats held the White House, the Senate, and the House, but today people are responding to a worsening epidemic of mass domestic shootings. I remember when the Sandy Hook elementary school massacre happened; Obama sounded convincing when he said that he would increase gun controls. Those were elementary school children! In fact, Obama signed only two major laws that address how guns are carried in America, and in 2011 he bragged, “In fact, my administration has not curtailed the rights of gun owners – it has expanded them, including allowing people to carry their guns in national parks and wildlife refuges.” Attempts to limit the size of gun magazines, expand background checks of gun buyers, and ban gun sales to buyers on terrorism watch lists all failed to pass under Obama. The legislation died on the Democrat-controlled Senate floor early in his second term, when he should have been at the height of his power – without another election in mind. Attempts to limit the size of gun magazines, expand background checks of gun buyers, and ban gun sales to buyers on terrorism watch lists all failed to pass under Obama. The legislation died on the Democrat-controlled Senate floor. Yet even what Obama proposed was inadequate. “For all the pomp and ceremony, nothing in the president’s proposals is going to put a dent in U.S. gun crime or even substantially change the federal legal landscape,” wrote Adam Bates, a policy analyst with the libertarian Cato Institute’s Project on Criminal Justice. Related, and also during the Obama administration, was the George Zimmerman-Trayvon Martin “stand your ground” tragedy. Obama said that if he had a son, he would look like Trayvon. He again sounded convincing, as though he would address the issue, yet there were more “stand your ground” states when he left office than when Trayvon was killed. This week, in a grotesque finale, Zimmerman auctioned off the gun he used to kill Trayvon for $250,000, after backing out of a lower offer of $150,000. 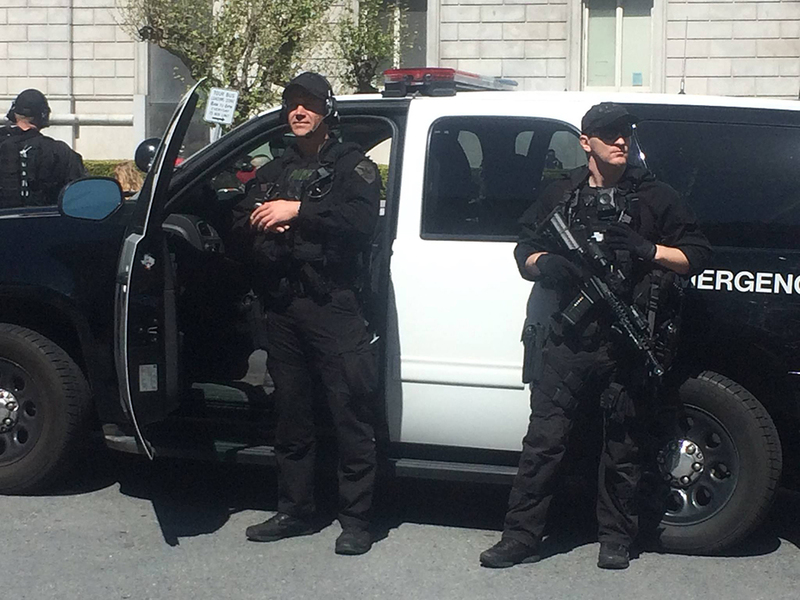 San Francisco Police monitor the San Francisco March for Our Lives, on March 24, 2018. The Pentagon now admittedly has more money than it can figure out how to spend, so its surplus weapons go to militarize the police who are most aggressive in Black and Brown neighborhoods. The height of the most recent anti-war movement was during the Iraq War under Bush, Jr. It faded away under the first Black president, but the wars didn’t fade away – they were expanded. What is stark now is that the Democrats don’t even want a peace movement under a Republican administration. There is bipartisan agreement that war is good for business, so Democrats are dodging the issue while supporting women standing up to predators like Harvey Weinstein, Donald Trump and Bill Clinton and sounding tough on gun control with no track record of follow-through. People might disagree about how different the two parties are on foreign policy, but it is clear that the Democrats are not an anti-war party. They support women’s marches and gun control marches that don’t talk about peace. The Democrats are not an anti-war party. Democrats don’t even want a peace movement under a Republican administration. Gun control begins at the Pentagon. 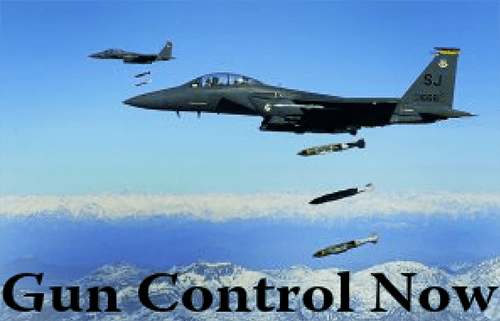 Until we stop the plague of endless war, a term coined immediately after, and justified by, 9-11, guns are the norm, and they will be on our streets as well as the streets of Afghanistan, Iraq, Syria, Yemen, and all the African nations now occupied by AFRICOM, the U.S. Africa Command. At the same time, our missiles will rain down on innocents in the name of specious “humanitarian intervention” and stopping terrorism. We need an anti-war movement, regardless of which duopoly party is in power. The lesser of two evils is the evil of two lessers. If we want peace in our streets, schools, movie theaters and music clubs, and those in other countries around the planet, we must march against war to affirm life. That’s a march for our lives that we desperately need. If we want peace in our streets, schools, movie theaters and music clubs, and those in other countries around the planet, we must march against war to affirm life. Women, the givers of life, are confronting the Pentagon Oct. 20-21. Riva Enteen is the former program director of the National Lawyer’s Guild and a current member of the steering committee for the Women’s March on the Pentagon. She was also chair of the first KPFA Local Station Board. She can be reached at rivaenteen@gmail.com. anti-war movement at the outset of the Iraq war under Bush Jr.
Black and brown neighborhoods receive more attention from law enforcement because blacks have over a seven fold higher crime rate, while brow neighborhoods vary but are at least twice the average rate. Different groups will receive proportionately more attention based on their propensity to commit crime. That is as it should be.